Students join author Rick Grant at Saturday’s rally kicking off the 10th Governor’s Summer Reading Challenge. 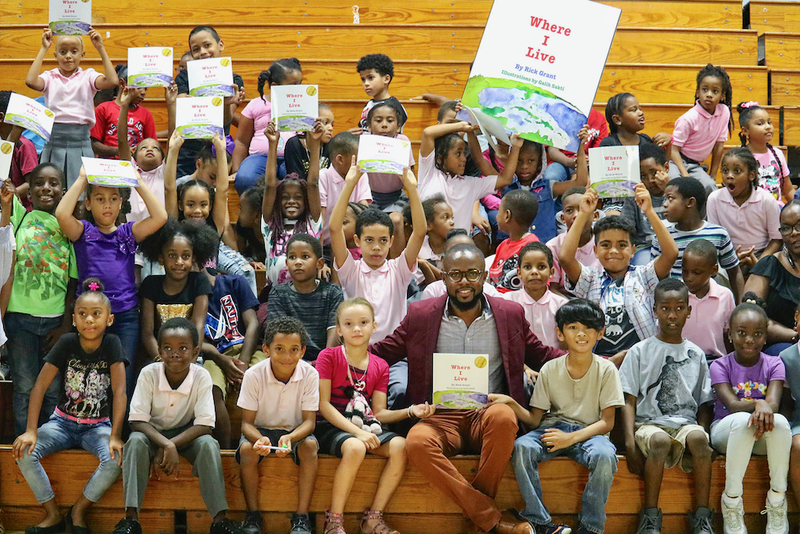 The 10th Annual Governor’s Summer Reading Challenge kicked off in the St. Croix District with a pep rally Saturday for more than 400 Alfredo Andrews and Eulalie Rivera Elementary students that included guest speakers, book readings, spirited chants, and giveaways. The program challenges students to read five or more books during the summer months. Saturday’s hour-long event took place at the St. Croix Educational Complex gymnasium and was a joint effort between the Department of Education’s State Office of Curriculum and Instruction and the Office of Public Relations. Denise Gomes, C&I program manager, led students in a chant that reminded them to read at least five books during the summer. She also instructed students to keep track of the books they read on the tracking sheet provided in their packets. The students, along with all public and private school students in the territory, received a packet containing two grade-level books, a tracking sheet and a letter from Gov. Kenneth Mapp. The Governor’s Summer Reading Challenge runs June 4 through Sept. 21 and is open to public and private school students in grades K-6. It is designed to combat students losing critical literacy skills during the summer months. Books provided to students from the Office of the Governor and the Department of Education are written and illustrated by Virgin Islanders or persons from other Caribbean islands. More information on the 2018 Governor’s Summer Reading Challenge is online at www.readfive.org.